1st Alaska Outdoor School is a center for the individuals who are looking to learn about and explore the amazing attractions that Alaska has to offer. Someone could visit Alaska many, many times and still not be able to experience the richness and beauty that the Alaskan environment has to offer. As part of this package, you will be accompanied by Alaskan Outdoor Excursion Experts who will help you to make the most of you Alaskan travels. Because this is such an exclusive program, you will be able to see beautiful sites and experiences that aren’t always toured on a typical Alaskan vacation or cruise. 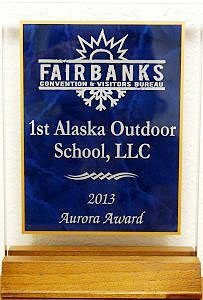 The First Alaskan Outdoor School, LLC is a great choice when traveling to Alaska. Everyday excursions are affordable to customers, and you get the full Alaskan experience without having to plan or worry about the details and directions. If you have any questions or if you would like to learn about all that Fairbanks, Alaska has to offer, please call (907) 590-5900 today.